"THE LIFE I LONG FOR IS MORE THAN MATERIAL POWER. IF HAPPINESS IS DERIVED EXTERNALLY, THEN ONE MUST BE DEPENDENT ON EXTERNAL OBJECTS. I WANT TO BE FREE. THE GREATEST JOY I HAVE KNOWN IS FEELING CREATIVE AND CONNECTED TO THE UNIVERSE BY SOMETHING I DO OR THINK. IF YOU DENY THE REALITY OF THAT JOY, YOU DENY WHAT I AM." Barbara Marx Hubbard is a self-described futurist, as well as an author, filmmaker, and public speaker. Deepak Chopra calls her “The voice for conscious evolution” and her life work has been dedicated to just that – conscious evolution being a concept Barbara describes as “evolution by choice, not chance.” Since 1966 Barbara has worked towards helping humanity put this idea into action, to evolve towards a positive future in which, “our powers are used wisely and ethically for the enhancement of all life on earth.” Saying Barbara’s career has been dedicated to saving the world would actually be an accurate statement here. On her journey over the years, Barbara has had the opportunity to work and become friends with some of the great minds of our time, including Jonas Salk, Buckminster Fuller and Abraham Maslow to name a few. At the time I started working on Inspire-Aspire, Barbara was at the top of my list as a “dream interview.” To me she embodied everything I was trying to convey and achieve – someone who had turned her passion into a career and who was using it to help the world … and having a blast while doing it! 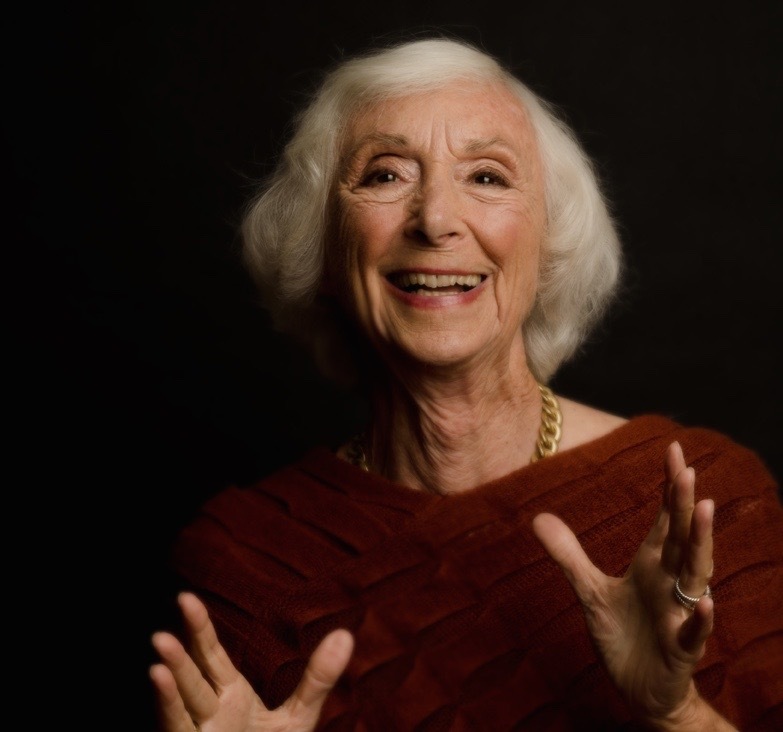 At 86, she is still making films, doing speaking engagements, interviews and writing articles; she hasn’t slowed down a bit and her zest for life is contagious. I knew I wanted to be like her at 86 – heck, I wanted to be like her now! – and, I wanted to hear every piece of advice she had to offer. Having the opportunity to interview Barbara was truly an extraordinary experience and just one of the many examples in this journey of a dream come true. You have a rather untraditional life story and career path. Can you talk a little bit about how you came to be where you are today? Yes, it’s true, I do have a rather untraditional story! But here is what I think is true of everybody and how I found my career path if that’s what you want to call it. Everybody has a unique creative essence, you can have many different names for it – your soul code, your life vocation, your calling. It’s something that’s so deep inside of you that when you get anywhere near being attracted to it, even if you don’t know what it is to begin with, you will feel what I call vocational arousal. In my case, I was a housewife in Lakeville Connecticut with five children. I loved my husband, I loved my children, I was in a clean house with clean water and a garden, but I was depressed … and I couldn’t figure out why. I felt guilty about being depressed. First of all, I was comfortable and secondly, I had this ringing in my ears of what the United States of America stood for – that being “life, liberty, and the PURSUIT OF HAPPINESS” – and I looked around and said alright, “we are pursuing happiness, but is anybody happy?” I mean if you have a whole nation pursuing happiness, I decided I needed to find out what it was that we were pursuing! And then I made a discovery that was absolutely critical in how I found this life path, it was through Abraham Maslow’s book Toward a Psychology of Being. He had the gift as a psychiatrist to start studying wellness instead of sickness, to study magnificent and very happy people, and he found that they all had one trait in common – chosen work they found intrinsically self-rewarding and of service. That’s the key to happiness. Whether you find it by being a mother, a fisherman, a gardener, a futurist or an astronaut, the point is that you’ve found it. When you find work that is self-rewarding, what that means is that the deeper essence of your being is being nourished by the expression of your work, such that you are being rewarded by the expression of who you truly are. So after reading this I realized this was true of many people in the world, but it wasn’t true of me! I was not happy, even though I really loved my children – they were the joy of my life, and my husband was a marvelous man – but it wasn’t my self-rewarding work. In other words, it wasn’t my vocation. I was taking care of loving, but my vocation was untouched and it made me so miserable. There were a lot of other people around me feeling the same way, many educated women were also depressed … it was when I started reading Maslow and also Betty Friedan that I realized I wasn’t alone. Betty Friedan wrote The Feminine Mystique, and interviewed many, many, women and found almost all of them depressed. This was because at that time, in the 1950’s, they had lost their identity beyond wife and mother. Even if they were educated, even if they had a creative impulse to do things, their identity was wife and mother. If that was all it was, it made you depressed – unless your innate vocation was wife and mother, then you could be totally fulfilled – but for most women it was not, and they wanted something more. Then I discovered the writings of a great philosopher called Teilhard de Chardin. He was a Catholic Jesuit priest who was never published by the church in his lifetime, who turned into a scientist paleontologist. What he did was he discovered, in the simplest language, that God is evolution. He discovered the law of complexity consciousness, that is – as the system gets more complex it jumps in consciousness and freedom … from single cell, to animal, to human, and all the way on up. He saw planet earth being connected – mind you this was before the internet! He believed the mind-sphere or “global brain” of earth would at some point connect and get its collective eyes, and we would shift in consciousness on this earth from fear and separation to unity and love like a global brain turning this whole consciousness of earth on. So when I read that – this is an interesting thing about my path – I immediately knew I wanted to work for that. Now you see there’s no way you could say my life path was working to turn on the global brain, because you couldn’t even think in those terms or what you were going to call it … I mean, you couldn’t get a job for trying to turn on the global brain! So instead, my vocation was to be a communicator; I found that my vocation was communicating evolutionary potential. And not only communicating it, but trying to embody it … That is to say, to be an example of an evolving human as I’m speaking of it to others and becoming a teacher of it. So I began, as many people have to do today, to invent my career. Inventing your career path – there should be a new name for it, because you usually don’t say career path around this level of innovation. Career path sounds like you’re going to be a doctor, a lawyer, you know, something that has a traditional form of study. But if you’re going to be an evolutionary innovator, if you have in your soul this impulse of emerging potential of your own and of the world’s, then you probably will become a social innovator and create your own vocation. And then what happens is that you realize that you are evolving, and I call this type of woman an evolutionary woman or a feminine co-creator. The feminine co-creator is a woman in who the creative impulse of life itself that can produce a baby is now giving birth instead to her own authentic self. She can be any age, you know the younger women have this very early now, but what’s interesting is the women over 50. When you go through menopause your body is no longer producing eggs to reproduce the species, and I have discovered that women who get turned on to their own creative potential after 50 are actually freed up – even at the bodily level from producing eggs – for producing themselves and their genius and their gift and their creativity for the world. So as an older woman, now 86, when I say yes to my life purpose – my creation, my spirit, the creative impulse within me – that spirit has no age. And as you do this, if you’re saying yes to the spirit within you, the creative spirit, you begin to become one with that creative spirit. And that, I have discovered, is regenerating. Yes, it’s clear it’s working from your career and your energy … you must be doing something right! Yes, what I’m doing right is continuing to express my creative potential in partnership with others and as many people as I can at a time when the planet itself is in crisis. For me, what I did was I began to place the rising up of the co-creative feminine in the crisis point of planet earth – when the age of masculine, top-down, dominating structures is declining and failing – so that the age of the co-creative culture of the cooperative humanity has to be rising. And it is rising fastest in the evolutionary co-creative feminine. So as we step forward into our life’s purpose like that – what makes it possible for anyone to do this – is you have to get in touch with self-rewarding work that is of service. That is the key. Because the whole meditation and love and wonderful family won’t last unless you find self-rewarding work. Like you see earth from space, it’s one planet … we are one people of this earth – that’s who we are and everybody’s a member of it. I’m calling all of us generation ONE in that we are the first generation on earth able to destroy ourselves by our own actions, and we are also the first generation on earth to be able to evolve ourselves by our own actions. So it’s the first age of conscious evolution and generation ONE – that is to say everybody alive on earth – is part of the first age of conscious evolution, whether they know it or not. Because we’re all affecting the whole system, and with global warming and climate change, and resource depletion, etc., that means everybody is going to be hurt by this, if not destroyed – so really we’re all in it together. So the career path of a woman – going back to this woman – is actually coming into new form at a time of planetary crisis, of destroying our own planet and culture, and for the planetary birth of a new culture creation and co-evolution. So this is the time for the feminine co-creator to rise up and guide humanity. Your life work has been dedicated to conscious evolution, can you explain to women what this means and why it’s important? In the simplest sense, it’s evolution by choice not chance. If you look at the billions of years of evolution that came before us, there were species that were interacting, and many hundreds and millions of them are now extinct, that were affecting their own evolution. We are the first generation, first of all to be aware of the whole evolutionary story of cosmogenesis – the origin of creation to us – that’s the first, and secondly, we’re the first to know we’re affecting it by everything we do. And third, you know that means the babies we have, the food we eat, the cars we drive, the way we parent our children, everything we’re doing is affecting our own evolution. And because we now have the internet and can connect so rapidly, we are also being connected as a living species, at a global level that was completely impossible even twenty years ago. It’s like a newborn baby … we’ve seen the miracle of a fertilized egg becoming a baby being born and then the shock of birth for the newborn … I think we’re facing the shock of birth for a newborn planetary culture. We’ve been going for about 5 billion years on this planet and now we have gotten to the point as a species to be able to overtake, pollute, and destroy … or create. And the women who are in it are – whether they know it or not – consciously affecting evolution by the babies they have, the relationships they have, and the career paths they choose. And so it just gives an added dimension to what’s already happening. What’s important about conscious evolution, is that if you look at the whole story from the origin of creation to now, and you realize it has a direction of higher consciousness, greater freedom, more cooperative order – for billions of years – then you begin to have guidelines for your own creativity; like what makes you more conscious, what makes you feel freer, what makes you more aware of how to connect to others to become part of a larger whole … you have value guidelines here. And you also have some kind of affirmation or depression or longing for something more; knowing that problems are evolutionary drivers, that crisis precedes transformation. You’ve said that through your work, you’ve been able to “transcend the dichotomy between selfish and selfless” to become a self-actualizer. Can you explain what this means and its importance? That’s very true because if you’re completely selfless I don’t think you can really be of service, or not very far. For example, as a mother with a newborn you’re completely selfless for awhile, but as your children grow up if you don’t find a way to actualize your own life’s purpose you won’t be of service. It’s really the way nature created us, it’s like we’ve had this tremendous desire to procreate and reproduce the species (you know that’s a very boring way of saying falling in love and having a baby) nonetheless, that’s nature’s intent – to have babies, and now I think nature’s intent is to have more wise and evolved people. So therefore the whole I’d say is that by doing my life purpose, as I am to try to give hope and direction to people the best way I can, that is the way in which I’m paying it forward and paying it back at the same time. So there’s all kinds of things to do, everything is needed and the main goal is to find the thing that you can do best, that is self-rewarding enough that you don’t have to go after the externalized rewards of life. Even money – a lot of people do their work for less money because they’re fulfilled by it, and they don’t feel that they have sacrificed anything. How do you think spirituality relates to self-actualization and what role has spirituality played in your career? Well, spirituality is at the heart of evolution for one thing, because when you think of the spirit in action of evolution from “no thing” at all to “every thing” that is, that spirit is in you and me. And that spirit is what’s moving us, calling us … to do more, to be more, to create more … so the essence of my work is spiritual – understood as spirit in action emerging as the impulse to create, to make, to love, to transform. You’ve mentioned an interesting point about spirituality, saying, “I thought that what sexuality was to the Victorian Age, mystical experience is to ours. Almost everyone experiences it, but almost no one dares to speak about it. We have been dominated by a scientific, materialistic culture which has made us feel embarrassed about our natural spiritual natures.” How do we go about embracing spirituality and its significance in our lives in a culture that doesn’t necessarily support it? Well, actually the culture is changing. For example, many of the leaders of silicone valley are now studying mindfulness and the soul. The Huffington Post, Google and Facebook, now all have places for people to go and meditate. So actually, particularly in the mindfulness arena, it’s being shown to be something that everybody needs in order to function and love better. I’ve had a lot of mystical experiences of expanded reality where I literally felt the planet as one living system and experienced the whole universal self of my frequency coming in. I think we are evolving as a species and that the word mystic is too narrow, like the word religion is too narrow, as we are incarnating the process of creation ourselves. I don’t call mysticism religion, I call it the natural impulse of evolution … which is the force of consciousness, spirit. You’ve quoted Robert Frost saying, “My life was a risk – and I took it.’ … Thank God I did too. It now feels natural to do something totally beyond my capability.” How were you able to overcome your fears and find the confidence to pursue your dreams? You know, one of the most helpful things you can do is find at least one other person who appreciates what you’re driving toward and get what I call a resonate core of two or more so that you’re not alone. You don’t have to be doing all of this alone, everybody can reach out to at least one other so that if you feel you need to take a step that’s risky, be within some form of circle that holds you. It makes a big difference. You’ve had some amazing role models in your life, saying that, “This reemphasized for me the importance of associating with peers who affirm human potential.” Can you explain the importance of positive role models to a woman’s personal and career growth? I think that it’s essential … we are social creatures and if we have no model of someone that attracts us to become like that person, if we only have models of people who are miserable, violent, or dangerous, it’s going to be very hard to be able to keep alive your own hope. We do a huge amount for each other by just showing up and sharing all our stories … I think it’s very, very important because as we see each other, so we become. What advice do you have to women about how to find their career vocation? You’ve said, “The creativity of every man, woman and child is touched with a spark of joy at knowing they are needed. Each of us has a purpose.” How do you recommend we get in touch with this purpose? The very first thing is to know what you want to do. I say ask the universe, “I want to find my vocation.” Then, the next step is to think in your meditations, in your journal, in your thought groups, “What attracts me?”, and start testing it out … doing some small steps. I did a lot of small steps that weren’t exactly the right ones, the fact is it’s like following those breadcrumbs, just take a small step towards what attracts you. If it’s the author of a book, see if you can find the author; if it’s a certain organization, see if you can go find somebody from the organization; if it’s a particular mystical path, see if you can join the group. In other words, you have to become activated to seek out what attracts you. Yes, and just to know that’s the direction of evolution and that you’re not neurotic, that you’re actually nature evolving. It helps people a lot to know that they’re part of something really important when they get turned on like that. Instead of describing work as a “job” or “career” you choose to call it a “vocation.” Can you explain the significance of this and why it is important to support the mind shift this word creates? GET INVOLVED: JOIN BARBARA IN HER LATEST INITIATIVE "WALK THE PATH OF THE EVOLUTIONARY WOMAN" HERE. STAY INSPIRED: CHECK OUT BARBARA'S WEBSITE AND FOLLOW HER ON FACEBOOK AND TWITTER TO STAY INSPIRED.